This property is located in the North West corner of Fairfield County on HWY 215 near Carlisle, SC. The single story brick home on the property is approximately 2000 sq.ft. REGISTRATION: By registering and bidding, Bidder acknowledges that they have read and agrees to the terms and conditions of the auction. Bidder agrees to sign the contract of sale and other documents related to the transaction, pay the earnest money deposit, and close the transaction if they are determined to be the highest bidder. BIDDER VERIFICATION: The identity of all online bidders will be verified. A Visa or MasterCard is required to register. No charges will be made to your card unless you are determined to be the winning bidder, and you fail to execute the Contract of Sale and pay the required earnest money deposit. At the discretion of the Auctioneer, a penalty of $2500.00 will be charged to the credit card provided at registration if you fail to return the signed Contract of Sale and pay the required earnest money deposit within the required time period. Payment of the penalty shall not affect other remedies available to the seller for such failure. ONLINE BIDDING:Auctioneer is not responsible for malfunctions or system errors, which cause a bid or bidder to fail to be recognized or registered. BUYERS PREMIUM: A 10% buyer’s premium will be added to the high bid to determine the final contract price. Seller pays deed stamps and deed preparation. Buyer pays all other closing costs. Taxes are prorated. All sales are final with no contingencies. Terms sale day govern. DOWN PAYMENT: 10% of the bid price will be due immediately after being declared the winning bidder. Personal checks will be accepted. SETTLEMENT: The balance will be due within 45 days. If the successful bidder fails to close within the time specified, Seller shall have the right to terminate the Purchase Contract and retain the down payment as liquidated damages in addition to other legal remedies. Seller and Auctioneer will divide the earnest money deposit 50/50. The Seller may, at their option, extend the closing past the designated Settlement date. Buyer agrees to pay 1% of the purchase price per month if Buyer is given an extended closing. DEED RESTRICTIONS: Any existing restrictions and easements. ABSENTEE BIDS: Absentee bids are welcome. FINAL BIDS: All bids are irrevocable by the bidder. Subject to seller confirmation. Seller may have 48 hours to accept and confirm the highest bid. Auctioneer reserves the right to extend the bidding closing time. THE SUCCESSFUL BIDDER will be required to sign the approved real estate purchase agreement. Within a timely manner following the conclusion of the auction, the contract of sale and other required documents will be emailed to the address provided at registration. Bidder must sign and return all documents along with an earnest money deposit of 10% to be made payable the R. H. Lee & Co., Auctioneers, Inc. by 5:00pm the following business day. The Contract of sale can be faxed, scanned, mailed overnight, or hand delivered to our office. Acceptable methods of payment for the earnest money deposit are: Cash (delivered in person to our office), certified funds, personal or company checks with prior approval, or wire transfer. FINANCING: While mortgage rates are favorable to qualified purchasers, this sale is not contingent upon financing. CONDITION OF PROPERTY: This property is selling in “As Is” condition, with no warranties or guarantees expressed or implied. The Seller will make no repairs, if needed. SURVEY: If a new survey is needed on this property, it may be done at the buyer’s expense. 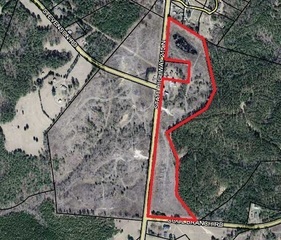 If this property is sold in connecting parcels, each adjacent buyer will split the cost of the new survey line(s). AGENCY: R. H. Lee & Co., Auctioneers represents the Seller in this transaction and is agent for the Seller only. AUCTION SUBJECT TO PRIOR SALE: Auction subject to prior sale does not mean it is our intention or goal to sell the property prior to the auction OR that there is a listed price posted on the property. Under the Real Estate Law, R.H. Lee & Co. Auctioneers, Inc. is legally bound to bring forth any and all offers to the Seller at any time they are presented. Although we endeavor not to encourage pre-auction offers unless they are exceptional, we are obligated to present all of them, regardless of when, or how, or from whom they arrive. Although the intent is to auction the listed property, the ultimate goal is to sell the property for a price satisfactory to the Seller. If the property is sold prior to the auction, the Auctioneer will do their best to give notice the other interested parties. NOTE: The information contained herein is subject to inspection and verification by all parties relying on it. No liability for accuracy, or errors and omissions are assumed by the Seller or their agents. ALL SQUARE FOOTAGES, DIMENSIONS AND TAXES, IF ANY, ARE APPROXIMATE. It is the responsibility of the buyer(s) to inspect and verify that this property is suitable for their intended use. This listing may be withdrawn or modified without notice to anyone. Buyer may receive confirmation auction day but may not have a fully executed contract until all selling parties have signed.